It’s been a very busy and exciting year. I think we all felt the bite of autumn last week, preparing us for the coming winter. – Dan Hume. Please find attached a couple of group photos from last week’s course. I’d like to say again what a great week it was and that Dan, Emma, Kevin and Nick were simply brilliant instructors who were patient, encouraging, motivating and inspirational. Thank you all so much! I have booked a navigation skills course for next year so hope to see you all again. FAO Emma – Just as you predicted, I found my cordage when I got home. It’s rubbish so I’m off out later to collect more nettles to make something better. Here at Woodlore, we’re already getting prepared for and looking forward to the start of next year’s UK course season, which kicks off in April 2011. Hope to see you there! 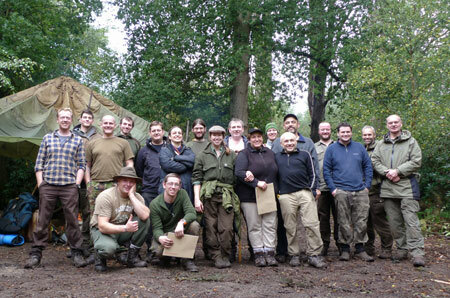 This entry was posted in Bushcraft Courses & Expeditions on October 8, 2010 by Woodlore Team.